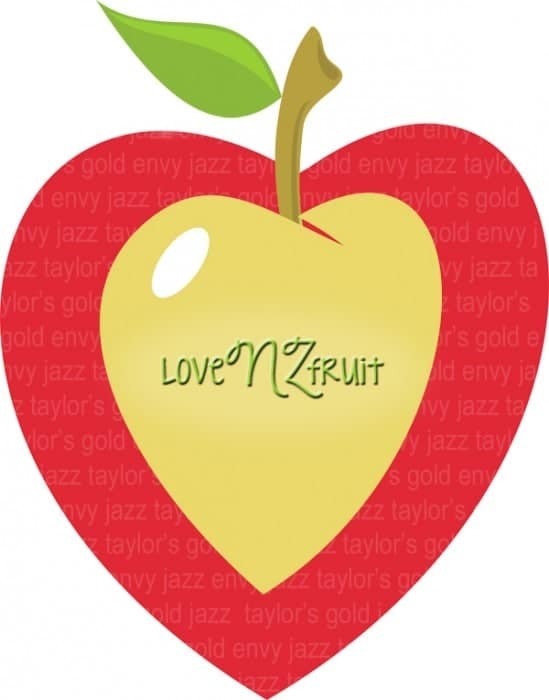 Disclosure: This post is sponsored by Envy Apples and the #loveNZfruit promotion. Please make sure to scroll to the bottom to enter the giveaway for a crate of Envy Apples (probably about 100!) and a $150 gift card. Plus, you’ll get an automatic entry for the grand prize of a Vitamix blender and a $100 gift card (awarded at the end of July at the end of the promotion)! I am not a salad girl. I eat them at restaurants so people won’t know that I’m not a salad girl and get judge-y, but short of peer pressure, I rarely eat salad. 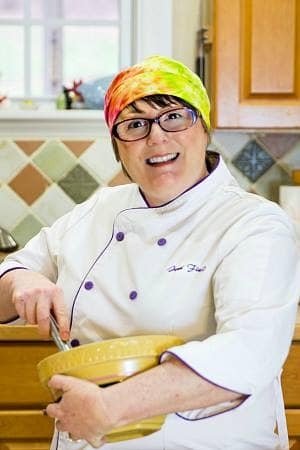 Look at my recipe index on Ye Olde Blogge. I don’t even have a Salad category. And if I did have a Salad category, it would be populated with all the potato salads and pasta salads my carb loving brain could dream up. 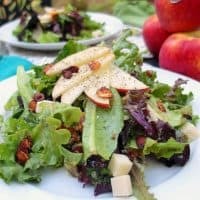 So, after the fun sorbetto I made with NZ pears last month, I decided to challenge myself to make a summer salad using the lovely Envy Apples. And they are lovely, too. I read over on the Envy Apple site that they are a cross between the best of Braeburn and Royal Gala apples, and NZ fruit people, let me just say that you did a Darned Fine Job coming up with these guys. They’re crisp and sweet, but they’re also nicely balanced. Their skins are thin so they don’t get in the way (if you normally peel your apples, you might find it unnecessary to peel these beauties). And the coolest thing about them is that they resist browning. Before I read that, I sprinkled my cut ones with Fruit Fresh to impede browning, but once I read about this slow-to-brown feature, I put it to the test. A few days ago, I sent a sliced Envy Apple–devoid of Fruit Fresh or lemon juice–in The Beloved’s lunch box. I pack his lunch around 6:30am, and he finally ate around noon. He reported back that the apple slices looked almost freshly cut. And almost freshly cut after 5 1/2 hours is pretty amazing! Okay, so back to this salad. I used Envy Apples both in the dressing and in the salad itself. Just to mix things up a bit, I roasted the apples for the dressing and used them raw in the salad. I asked some buttery, medium cheddar to join in as well as some Bacon Flavored Almonds. The fabulous Marly of Namely Marly came up with these beauties, and I just had to make them. More than once. You can find the recipe for them on her blog. And let me tell you, I’ve made this salad with both crisp crumbled bacon and with the “bacon” almonds, and I prefer the almonds. There’s something about the sweetness of the nuts that plays nicely with the cheese and apples. And the smokiness and crunch they bring to the dish really just makes the whole thing. Huzzah, Marly, for coming up with these little slivers of deliciousness! While it is great to eat seasonally and locally, and we try to do that as much as possible, it is also great to know that these apples from the Southern Hemisphere are at their peak and we can enjoy them in the middle of our summer. That’s one of the reasons I agreed to be a part of this promotion: the round earth is a magical place, and when we’re sweltering here in the US and Canada, the folks in New Zealand are bundling up and harvesting apples. How much fun is it to take a fruit normally reserved for warm flavors–caramel, cinnamon, clove–and use them in a warm weather recipe?! I will tell you. It is very fun. You are going to love this salad. It is so delicious that after I took the photos (twice), I ate the whole thing (twice). And nobody was even watching! And I didn’t just eat it. I kind of inhaled it. It’s tangy, sweet, smoky, crisp with fresh apples with a mellow nuttiness from the cheese and the “bacon” almonds. I think you’ll really enjoy it. Do give it a try. Envy Apples are pretty new and are a little bit hard to find here still, but they’re worth seeking out. Maybe you could even talk to your local grocer about carrying them in the summer. And hey, why not follow Envy Apples on twitter and follow the hashtag #loveNZfruit all summer long? And check out their website as well. That’s where I learned all about the non-browning. 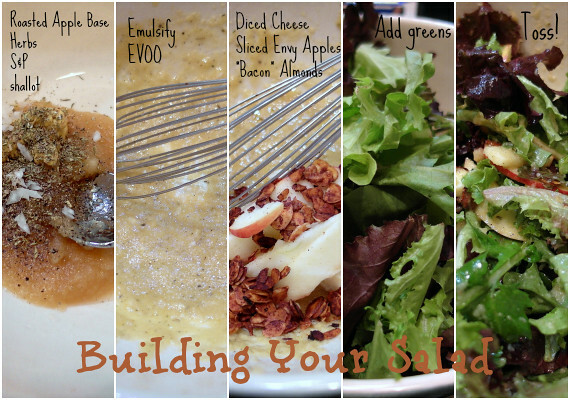 Oh, and you also build the whole salad–dressing and all–in the same bowl. Fun! Feel free to use your favorite mix of greens in this salad. If you want to use arugula and baby kale, by all means go for it. I like to roast a few apples and blend them with the vinegar right in the blender. That way I can make dressing for as many or as few salads as I'm making, and make it right to order. The base keeps in the fridge for a good 2-3 weeks. 1-2 Tablespoons diced cheese, , a medium-sharp buttery nutty cheese is ideal. I used an aged cheddar. 1/2 Thinly sliced Envy Apples, (I left the peel on mine. You can peel yours if you want). a few additional "bacon almonds"
Roast the apples at 375F for about 30 minutes, until just beginning to get golden on the outside. Place the roasted apples in your blender and add the vinegar. Cool and chill. Store tightly covered in the refrigerator. Put the dressing base in a bowl large enough to hold all the ingredients including the salad greens. Add the shallot, mustard, herbs, salt and pepper. Whisk well to combine. Slowly drizzle in the olive oil, whisking madly, until nicely emulsified. Taste and adjust seasonings as necessary. This dressing is very thick, so worry not. 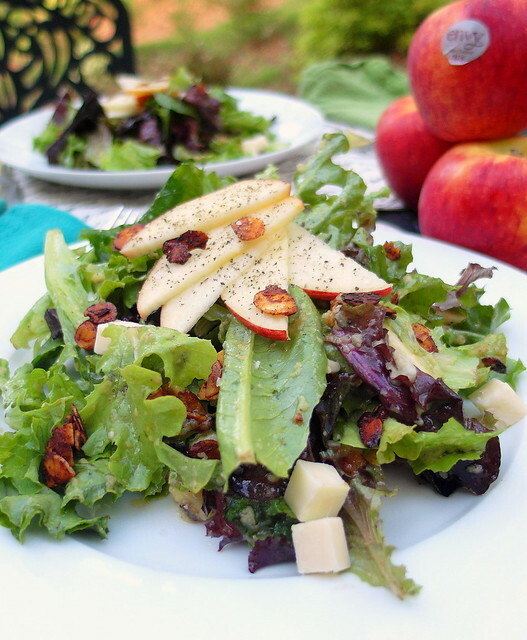 Once the dressing is emulsified, add the diced cheese, Envy Apple slices and "bacon" almonds. Put the greens in on top. 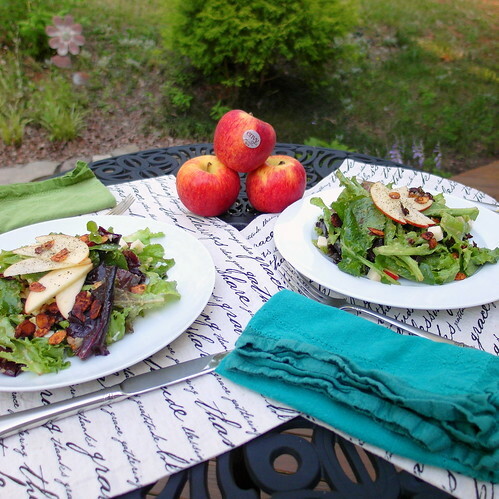 Using clean hands or salad tongs, toss the salad thoroughly to get a nice coat of dressing on all the components. Evenly distribute the finished salad on large plates. 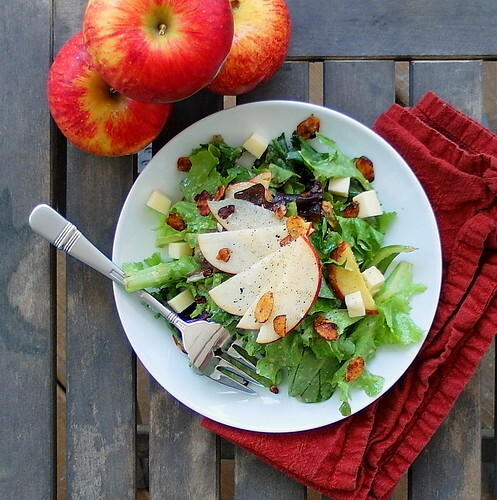 Top each with a few pieces of additional cheese, the fanned apples and a few more "bacon" almonds. Finish with a touch of fleur de sel and freshly ground black pepper, if desired. And now that you have this great salad, go check out all the other fantastic summer recipes from our other talented bloggers. And don’t forget the giveaway! There are a bunch of chances to enter, so get going. Thanks for spending some time here with me today. Have a great day. I don’t know which I am happier about…that you ate the salad without anyone watching (twice!) or that you are giving me such a delicious recipe!! 🙂 Thanks, Betsy! It really is delicious. I hope you give it a try! HOLY CRAP, JENNI — I made this vinaigrette yesterday and I can’t stop talking about it. It’s the best dressing I’ve tasted in years — and I make a lot of vinaigrettes, 3 or 4 a week. I made it to use on a chicken & wild rice salad I was planning, but then I decided to add a few shreds of red cabbage, and when that apple vin hit the cabbage, all I could think about was using this dressing for a slaw. Which I am doing immediately, like tonight. I mean, what’s more natural than apple and cabbage together? Seriously, people — anyone reading this must make this dressing Right Now. Anything where a sweet-ish dressing works will love it — any bitter greens, arugula, endive, etc. I haven’t yet made the bacon almonds, but am betting they’d work great on a slaw, too. This just pushed all the summer tomatoes and basil out of my brain. Come autumn, this is gonna get a real workout in my kitchen. I am thrilled that you like it so much! And what a fantastic idea to use it as a dressing for slaw, Maggie. You’ll have to let me know your results. It was autumny enough today that I made this vinaigrette again and kept my word about dressing a slaw with it — and it was divine. You MUST try this dressing on a cabbage slaw. And this time I made the almond ‘bacon’ and all I can say is Yowza. Them’s some little flavor bombs. I’m gonna make a double batch this weekend since I have all the ingredients now, freeze ’em and jazz up lots of salads with them the next few weeks. Thanks Jenni, both of these were real winners. Oh, hooray, Maggie!! You should go over to Namely Marly’s site and tell her how much you love the bacon guys–she would be thrilled! I am not a slaw fan–something about the particular crunch of cabbage, but The Beloved loves it. I will make it for him sometime, for sure. He will be thrilled! Make those for TB. He will thank you.